Previous PostGreat Chefs of New Orleans: Austin LeslieNext PostRIP – Joseph Casamento, Jr. This is so cool! Not only are you a famous Austin “landmark”, now it seems you are one helluva cook. My man I am impressed!! I am going to try this recipe and show some of the people of Austin what they have misjudged. Thank you Sir. And Bon Appetite!! I tried this recipe, except I used canola oil. It turned out wonderful. 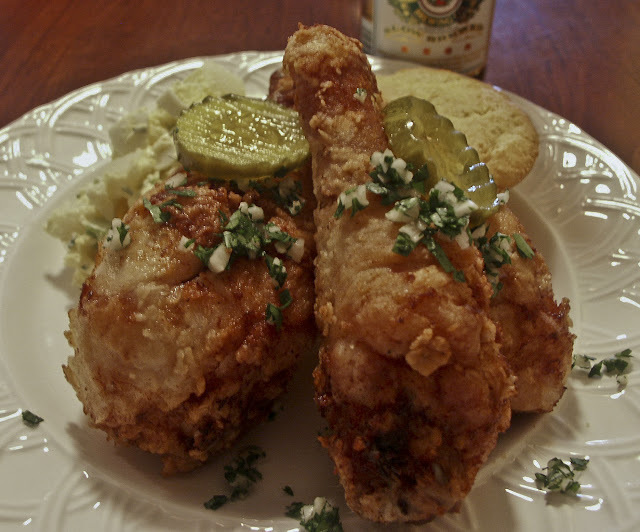 I’ve been looking for a good fried chicken recipe for a long time, and this is the first one that comes out crispy on the outside and juicy and not overcooked on the inside. Sorry I never got to go to New Orleans and have Mr. Leslie’s cooking. He seemed like a very nice man as well as a great chef. This is truly a note worthy blog. Very nice! I just made this receipe. Dynamite. I just found your website while trying to find out more about Austin, and it occurred to me that it might be beneficial for us to have links to one another’s sites. Email didn’t work, so I figured I’d try commenting! We are a museum devoted to the celebration of Southern food, and although we include all of the South, we do concentrate a good deal on New Orleans and Louisiana cuisine. We’d love to have your link in our resource page to provide people a place to get recipes and restaurant reviews, and we would love to expose your readers to our in-depth discussion of food and culture. Please let me know if we can work this out! Our website is http://www.southernfood.org and we have a great museum space in the Riverwalk Mall in New Orleans you can visit next time you’re in town! If you use this recipe precisely as it’s written, you may never order fried chicken in a restaurant (heaven forbid in a fast food chicken chain) again. This is the “fried chicken” everyone wishes they could eat and spends a lifetime looking for. Thanks so much for putting this on the web. I used the have the small cookbook from Chez Helene, but cannot find it now. Austim was truly a great chef and bold character. I knew one of his relatives, Gary, but moved from the area and we have lost touch. If you know where I can get another copy of the cookbook, please contact me.